Just 20 minutes drive from St. Petersburg is the city of Pushkin, existing on thefor two centuries as the official summer residence of Russian emperors "Tsarskoe Selo ". The history of its creation is connected with the names of the crowned mistresses of Tsarskoe Selo - Catherine I, Elizaveta Petrovna and Catherine the Great. Tsarskoe Selo is another brilliant residence of Russian emperors. In 1710 Peter I presented these lands to his wife Catherine Alekseevna. Soon construction began and improvement of the manor. It was built a stone two-story building length of about 50 meters, with 16 rooms and an orchard. After the death of Peter I, the name of the Saar region The manor (from the Finnish word Upland) was renamed Tsarskoye Selo. Catherine left the house of her daughter Elizabeth, who was very fond of these places. After death Catherine I in the "uncomfortable" years of the reign of Anna Ioannovna Elizabeth only in Tsarskoe Selo felt relatively safe. Having established itself on the throne, Elizabeth decided to impart a new family country estate appearance. She was firmly convinced that the construction of new luxury palaces - part state policy, which affirms the greatness of the empire. And in 1752, at her direction, the architect Francesco Bartolomeo Rastrelli proceeded to reconstruction of the Catherine Palace. Based on the old house, he designed a huge three-storey building with a length of almost 300 meters. On the gilding of external and internal decorations of the palace took more than 100 kg of red gold. Rastrelli wanted to bring the building of the palace to perfection, so everything was repeatedly altered. Five years have lasted the construction of the palace, and decorative decoration continued until Elizabeth's death. However, the years of work of the great master became for him the starry hour. 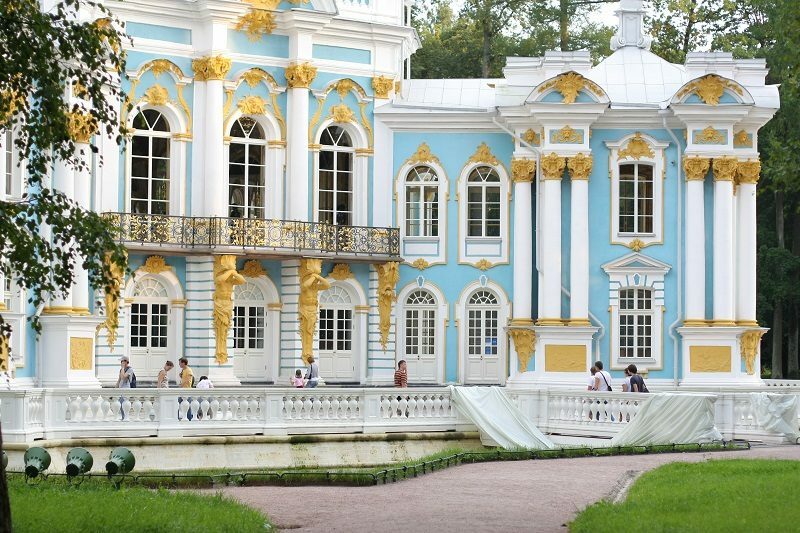 Catherine Palace - a masterpiece of Russian Baroque - strikes the imagination and to this day. Among the numerous rooms and rooms of the Catherine Palace there is a special room in which is the most luxurious gift of the century. In 1716 the Prussian King Friedrich Wilhelm gave Peter I the Amber Room. Relief images of ancient goddesses, Florentine mosaics, scenes on biblical subjects, coats of arms, monograms and crowns were collected from thousands polished amber plates. "The eighth wonder of the world" was produced in 1709 according to drawings architect Schluter. The amber room produced a particularly strong impression in the evening time with lighted candles. The light penetrated into the depths of the transparent amber and the stone seemed glowing from the inside. The vision was not real, creating the impression of an animated fairy tale. During the Second World War, the Amber Room was dismantled by fascist invaders and taken to the territory of Germany. Her whereabouts are still not It is established, but attempts to recreate the Amber Room are being made to this day. regular gardens. Its sights are various pavilions created by projects Rastrelli. turned him into his office. At the end of the main avenue of the park there is the pavilion "Hermitage", intended for dinners and entertainment chosen circle of courtiers. There was a mechanism in the building that led to movement of the lifting tables, which allowed the hostess and his guests to manage on the second floor without servants. During the reign of Catherine II, who was a fan of the classical style in architecture, in New buildings appear in the park. The architect V.I. Neelov builds a soaps room for the Empress (pavilion Upper bathroom) and a marble bridge - a copy of one of the creations of the famous Italian architect Palladio. However, the idea of ​​classicism in architecture for the empress was fully realized English architect Charles Cameron. In 1779 he came from England by invitation Catherine II. In Peterburg, he immediately won the sympathy and confidence of the empress. In his personal Correspondence with Grimm she wrote: "Now I'm settled with Mr. Cameron; by birth Scotsman, Jacobin by conviction, a great draftsman, brought up on classical samples, he gained fame thanks to his book on antique baths ... We are mastering it here is a terrace with hanging gardens, with a bathing area below and a gallery above. " In this structure, known as the terms of Cameron, revealed all the talent of the architect. This The complex includes a cold bath with agate rooms, a walking gallery with a staircase and ramp and a hanging garden. Leading role in the Tsarskoselsky ensemble of Cameron is played by a gallery, called Cameron's only 100 years after its creation. With bath-baths it is united by a common ground floor and gallery. In the gallery the empress ordered to place Busts of 30 favorite philosophers. To the doors of the gallery is a massive staircase, decorated with two statues - Hercules and the flower goddess Flora. When the Empress became old, and it became difficult for her to climb the numerous steps stairs, Cameron built for her a ramp, which provided the shortest way out of the agate rooms in the park. This completion harmoniously intertwined in the architecture of the completed ensemble gallery and created a smooth and beautiful transition to the park. In 1796, specifically for the grandson of Catherine the Great Tsarevich Alexander on the day of his marriage with the princess Elizaveta Alexeyevna, was built a separate palace - Alexandrovsky, in a strict classical style, with a majestic colonnade and picturesque an English park, now called Alexandrovsky. Later Tsarskoe Selo became a favorite place for the future emperor. Inside the Alexander Palace you can visit the personal office of Alexander I, go through rooms of Emperor Nicholas II and his wife Alexandra Feodorovna, get acquainted with artistic taste of the last Romanovs. Then fashionable in the XVIII century, landscape English gardens replaced the regula French. Since then, the trees in the Alexander Park have not been cut, their selected specifically for the color of foliage at different times of the year. In 1817, a thousand maples, lindens, elms, ornamental bushes from St. Petersburg gardens, and some - yew, boxwood were purchased in Hamburg. The only spring in the park and at the same time the most elegant sculpture is called "Milkmaid" or, as it is also called, "Girl with a jug." The large pond near the pavilion "Grotto" is an artificial pond, 2.5 meters deep. When Catherine II on the island played an orchestra, and park visitors rode on boats and listened to music. Directly from the water rises Chesme column, built by the architect Rinaldi, established here in 1774 in honor of victories in the Russian-Turkish war.